Hello, and welcome to Market Shoppers Blog, the only Market Blog. The aim of this blog is to discuss and high light market issues as well as keep all market stakeholders informed about their markets and traders. I will be as accurate as possible and provide the utmost honest feedback on my experience of each market either good or bad. I want my readers to engage, show passion, share knowledge and interact with the blog and each other, this way everybody can benefit. 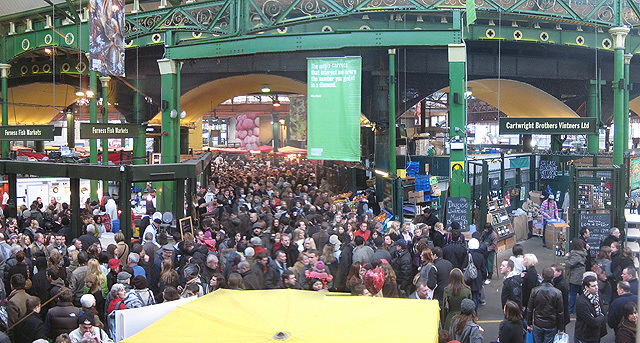 The famous food and drink market has occupied the space near London Bridge for over a 1000 years and the lease on many stalls have been passed down from generation to generation. Please note: Pictures and some information were accessed from Romford recorder and geography.org and broxapdesignandbuild webpages. In the event of an email enquiry, please allow us reasonable time to respond to your query. if you are a market trader and want a blog about your store and you are based around the west midland get in contact through the above email.